Yeats College students Ciara McGarvey who got her first choice of veterinary in UCD and Fergus McCabe who received his first choice of medicine at NUI Galway. 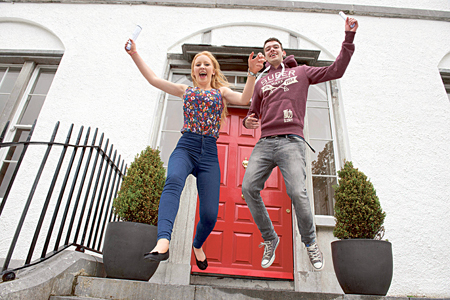 Now that the jubilation of the Leaving Certificate results has started to calm down, it is time this week for students across Galway to find out what their next academic step will be with the first round of CAO offers being released on Monday. As with recent years, the recession and the possibility of work in certain fields has influenced the changes in points with business and science related courses at the two Galway third level institutions experiencing a marked increase. There was an increase in CAO points for 34 NUI Galway, 15 of which increased by more than 20 points. There was a huge increase in demand for commerce courses in NUI Galway with general commerce increasing from 340 to 375 points. It was also clear that students are very much aware of the need for a foreign language to compete in the global jobs market with commerce (international ) with French increasing in points by 30 to 525, commerce (international ) with German jumped 45 to 450, and commerce (international ) with Spanish increased by 50 points to 460. Business information systems recorded an increase of 30 points to 400 while commerce (accounting ) is up 20 points to 440. There is also a lot of demand shown for science courses at NUI Galway with biomedical science rising from 540 last year to 545 this year, biopharmaceutical chemistry is now up 10 to 505 points, biotechnology is up 20 to 465, and environmental science is up 25 to 400 points. A new course in physics is offering places to those students with 400 CAO points or more. Also new to the NUI Galway course offering this year is arts with journalism which at 480 points has generated significant interest. The general arts degree, the second largest CAO undergraduate course in the country, remains unchanged at 300 points despite the downward trend in arts courses nationally. In relation to law courses both civil law and corporate law experienced point increases of 10 and 15 respectively. This year’s release of first round CAO offers showed that engineering courses remain popular with Leaving Cert students with electrical and electronic engineering soaring 60 points to 515, while civil engineering and project and construction management both increased by 30 points. Energy systems engineering, taught in NUI Galway’s award-winning Engineering Building and home to the largest school of engineering and informatics in Ireland, increased 10 points to 440. Podiatry, the only course of its kind in Ireland, is up 10 points to 470. There was also an increase in demand for general nursing, psychiatric nursing and midwifery courses while the demand for medicine remained largely unchanged. Commenting on current trends was NUI Galway’s admission officer, Stephen O’Dea who said: “This year, CAO applicants have their eyes firmly the jobs market with marked increases in demand for commerce and science courses in particular. Meanwhile demand for science, computing and agriculture courses at Galway Mayo Institute of Technology (GMIT ) continues to be as high as last year reflecting the national trend. GMIT has increased its number of honours degree (level 8 ) offerings by 50 per cent for this academic year (2013/14 ) in response to market demand. This has resulted in a doubling of the GMIT level 8 offers to applications in round one of the CAO. Apart from the new level 8 offerings, the highest increase in other level 8 courses in GMIT were in the Bachelor of Science in medical science, which jumped by 20 points from 390 to 410, and the BA in heritage studies which also increased by 20 points from 225 to 245 points. Monday’s release of the first round of CAO offers show that of the 45 ordinary degree offerings (level 7 ), points increased for 11 of them. The highest increase was for the Bachelor of Science in physics and instrumentation which jumped by 35 points, from 290 to 325. The B Eng in architectural technology increased by 10 points, from 155 to 165 points. Points for the level 7 BSc in physics and instrumentation increased two years running. According to the CAO figures this year there was a marked increase in the number of Leaving Certificate students who chose a GMIT programme as their first preference and it is expected that this will result in a higher acceptance rate as traditionally 75 per cent of candidates will accept one of their top three preferences. Overall, GMIT has done well in terms of points compared to last year despite slight decreases for 10 courses, according to Michael Hannon, registrar of GMIT, who explained: “Construction-related programmes continue to present a challenge in attracting students, a trend reflected across all colleges. GMIT’s Engineering School has responded to this by offering multi-point entry, which gives students greater choice and flexibility as they progress through each year.